Wilkes-Barre, Pennsylvania, April 10 - A groomer was killed by an African elephant named "Dumbo" between performances at the Irem Shrine Circus when the animal was startled after coming in contact with electrical wires. 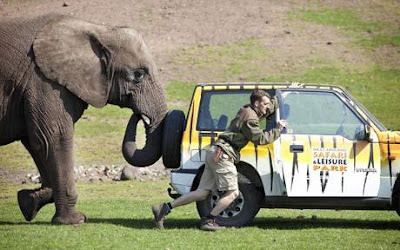 Bewdley, Worcestershire, U.K., April 26 - "Five," an 18-year-old elephant at West Midlands Safari Park, spontaneously helped his keeper push his jeep after it broke down. Kiev, Ukraine, April 26 - A 39-year-old elephant named "Boy" collapsed suddenly at the Kiev Zoo and is believed to have been poisoned to death, after surviving an earlier poisoning in the 1990s. Oxford, U.K., April 27 - Researchers at Oxford University have identified one of the low rumblings that elephants use to communicate as a warning about the approach of bees. Elephants fear bees, which can sting them around their eyes and inside their trunks and have been known to kill calves before they develop a thick protective hide. Using recordings of the warning may be a low-tech solution to keep marauding elephants away from the fields and homes of Kenyan farmers. Thekkady, Kerala, India, April 28 - The hunt is on for a 10- to 20-year-old bull elephant dubbed "Alpha" that has now killed 12 female elephants in Periyar Reserve Forest, home to 800 elephants. Officials want to capture and trim the tusks of the animal before releasing him.